Does low fat diet mean low calorie? A low fat diet is a term that can be confused with lower fat. A lower fat food may not be as low fat as you would hope. For example a low fat muffin can have as many as 400 calories and 5 grams of fat. The term ‘lower fat’ just means less fat than a comparable one and still can be high in fat. So lets take a quick look at some of the recommendations of a general Low Fat Diet would suggest you eat. For Oils and Cooking Fats: Olive oil, canola oil, and safflower oil. So are these oils no fat? No. These oils are still full of fat. These are just the healthy choice of fats. Olive oil is considered a healthy fat because of its high monounsaturated fat content but still contains 14 grams of fat per tablespoon. Fish: Canned fish should be packed in water and the healthy choices include tuna, sardines and salmon. Fish contain the healthy Omega 3 fat and salmon contains 5 grams per 3oz serving. The water packed sardines contain 7g of fat in less than a 3oz serving. Vegetables and Fruit: Corn, peas, beets, mushrooms, asparagus, tomatoes, apples, pears. Canned vegetable should be packed in water and canned fruits packed in fruit juice not syrup. 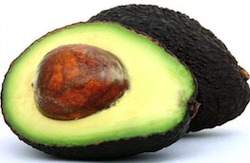 Avocados are high in fat – but the good fat and high fibre too. Beans and Grains: Good for fibre and proteins and all sorts of nutrients and low, low fat. Nuts and Seeds: High fat, high fibre foods are sunflower seeds, sesame seeds, poppy seeds, and flax seeds, almonds, hazelnuts, walnuts, peanuts, pecans and pumpkin seeds. Gain Weight by Eating Healthy? I have had clients that were befuddled as why they were not losing weight even though they were ‘eating healthily’. Just a quick review of their diet indicated they may have been eating healthy foods but not in a healthy manor. One such client was eating several handfuls of almonds per day. To clarify – nuts are full of fat, one gram of fat is still 9 calories regardless of whether the fat came from a french fry or an almond and 3500 calories is approximately one pound. So a handful of 23 unsalted almonds is around 14g fat, and 162 calories. Yes, almonds are much better for you than french fries but be aware of what – and how much – you are eating. This is just a short list and by no means a full account of a healthy diet, but as you can see low fat doesn’t mean no fat and all fats are not equal. And “good for you” doesn’t mean low fat either. It can be confusing to learn how to eat healthfully with all the rules and seemingly conflicting information but there are great books and programs out there that can really help clear up the confusion. It is important to educate yourself by research, non-fad products that are geared toward a healthy lifestyle as opposed to the lose weight fast products. By not reading what is sold on the grocery shelves you can be buying low fat foods that can be stuffed with carbs or sugars and can still be very high in calories. Fat gives a food its flavor and in order to reduce fat in a product, the product needs to be altered to produce a taste and a consistency palatable to the consumer. This is often replaced with food and chemical additives; as a result, in some instances a low fat or a fat free product has more calories than the unaltered product. Alternatively, it may contain several unpronounceable chemicals like artificial sweeteners which have been linked to memory loss, hair loss, and other various diseases including cancer. Low calorie, low fat foods isn’t always the way to go and especially a zero fat diet isn’t realistic nor is it healthy. We need fat for body and brain functions and there are many healthy fats found in such sources as fish, olives, flax seed, and many other natural healthy food sources. Please note, the above measurements were taken from various brands of foods and may or may not be specific to all brands.